Anupama Krishnan Kutty from Bangalore, B.E. - B.Tech Graduate. Anupama Krishnan Kutty is My CV and currently have no work experience. BMC REMEDY MS OFFICE OUTLOOK BACKUP & RES.. LEAN IMPLEMENTATION OPERATING SYSTEM LOGISTICS & PROCUREM..
are one of expert skill area's of Anupama Krishnan Kutty . 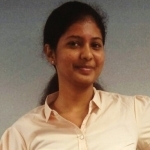 Anupama Krishnan Kutty is working in Materials/Logistics/supply chain management industry.